I remember the repeats on ITV. I saw the first few minutes of When The Heat Cools Off at my aunt's place in North London. This was back in August 1984 and earlier that day, LWT showed a trailer for it. It was on a Friday night. I can remember ITV showing a trailer for the Spy Probe repeat in '87 and that was in the Top 10 list of programmes that week, getting 10 million viewers. Not bad at all for an old show. I agree. My brother never liked Greavsie, thinking he was a gob*****. He should have stuck to talking about soccer with the Saint. I remember his chat show It's A Funny Old Game or something which Alexei Sayle once mimicked on his late '80s show Stuff. George Best was a guest at one time. Ah yes, Sporting Triangles hosted by TV-AM's Nick Owen. How can I forget? 1987 wasn't exactly a great year for UK action TV. Although there were plans to premiere a TV movie called The Zero Option which I think ITV wanted to use to fill in the Saturday night void left by Dempsey & Makepeace but it was shown a year later due to the Hungerford tragedy still fresh in people's minds. 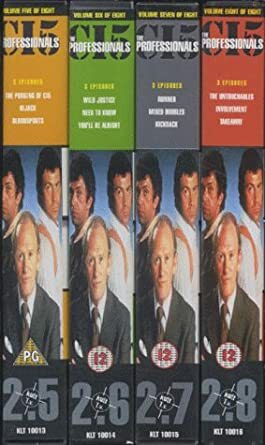 The above eps are very good, although I would class them as 'typical' Pros eps - The Madness of Mickey... and DIAGY weren't, and worked brilliantly. On the flipside, 'The Gun' and 'It'll Be Alright' weren't typical either, but were dreadful. You're right. I think The Gun would have been better if it didn't feature that boy and the slushy music. 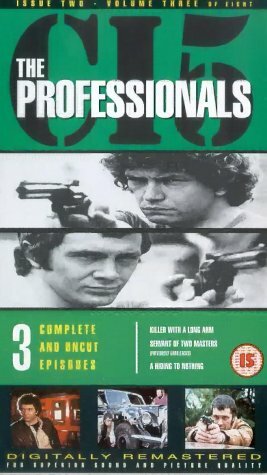 If it was just about Bodie and Doyle tackling the drug smugglers then it would have been a decent ep. You'll Be Alright could have been a Sweeney episode, especially if it was part of a 5th series. The only good thing about 'The Gun' was Celia Gregory (the world's best looking referee ). Yeah, she was okay in it. One of Bodie's more classier girlfriends. But Jill Baker and Rachel Davies were great as well in Hijack which also could have been a Sweeney episode (the story was about a bullion robbery linked to a corrupt foreign official). 'Hijack' could have been a Sweeney episode as Dave King was in 'Pay Off' and Stephen Yardley was in the pilot 'Regan'. I liked 'Old Dog With New Tricks' but I've never liked the bit where Cowley pretends to be the Home Secretary. The average person might not have known what the Home Secretary looked like in the 70s but not people who were going to take him hostage! We do see Pamela Stephenson wearing a white bra. We also see Anthony Andrews' hands as Bodie. Really? Is that the bit where he is removing the grenade from her chest? I have see pics of AA as Bodie from this scene. To be honest, he looks more like a school teacher from the chemistry department rather than a military man which Lewis Collins fitted in with to a tee. Yep, Dave King and Stephen Yardley were Sweeney veterans. Also, You'll Be Alright's Derrick O'Connor was in Sweeney ep Night Out and Out (Tom Bell). 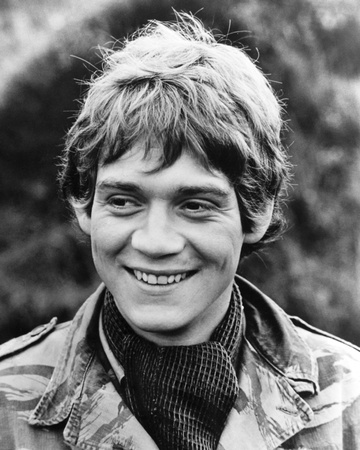 I read somewhere that Anthony Andrews' hands were used when Bodie takes the glasses of Dr Brook. His hands seem smoother and not as big as Lewis Collins'. Here are 2 photos of AA as Bodie. He just doesn't look right. He doesn't look as rugged or masculine as Lewis Collins who was born to play Bodie. He looks ill matched with Martin Shaw. Yeah, can't really imagine anyone other than Lewis to partner Martin. Wonderful chemistry. This is perfectly demonstrated in 'The Purging of CI5'. After the bomb goes off in Cowley's office, Bodie and Doyle head back to the lift, and Doyle pushes the button. As the door opens, Bodie says "I've never noticed that before." Bodie: "Streak of yellow down your back." As the lift door closes you see them playfully fighting and laughing. A lot of nonsense has been quoted about Lew and Martin's relationship. It's true, Martin wasn't keen on Lewis in the first instance, when he first replaced AA, but soon afterwards realised Lewis was ideal for the Bodie role. Oh yes, Jill Baker from 'Hijack'. Scrummy. I don't know if the scene where Bodie grabs the grenade are Anthony Andrews' hands but it wouldn't surprise me if they were as you don't see Bodie's face so there was no need to reshoot the scene. I am pretty sure they reshot all Anthony Andrews' scenes. Interesting to read that Andrews only took 2 attempts to lob the grenade into the bin. Collins took seven goes to get it right! Also very interesting to read that during Block 3 (1979) Lewis was very often late and caused production to be held up many times. Martin was nearly always on time. No wonder there was friction between them! 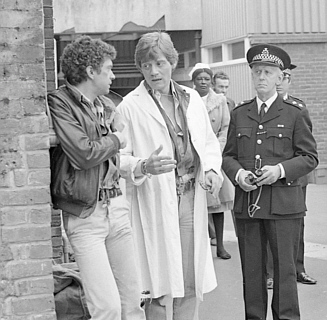 I think back then, Lewis liked living it up a bit and there were at least 1 or 2 episodes in the 1980 batch where Bodie was late for work. Maybe like Martin, he was fed up with the show. By 79, Lewis was certainly acting the star! He was even a judge on Miss Anglia 1979! It's a pity he never got cast as Bond. Imagine what the films would have been like with him as 007. They would have been more hard-edged and grittier than what came before. Yes, it will forever remain one of the great unsolved mysteries as to why Lewis's career nosedived after the great 'Who Dares Wins'. I'm pretty sure 'Backtrack' was delayed by a few months because Lewis had a parachute accident. I seems to recall he broke his ankle. There are a couple of dialogue errors in that episode. I used to buy the double episode videos in the early 90s. There was a 3 episode video with 'Klansmen', 'Everest Was Also Conquered' and another episode I can't remember. The other episode was 'Close Quarters' as I found a photo of the cover. There's a misprint as it should be 'KlansmEn' not 'KlansmAn'. The video I had was the earlier Video Gems version. I had all the Video Gems videos volumes 1-15. The Old Dog With New Tricks/Klansmen video is the later version released by Contender Video on their Kult TV label. 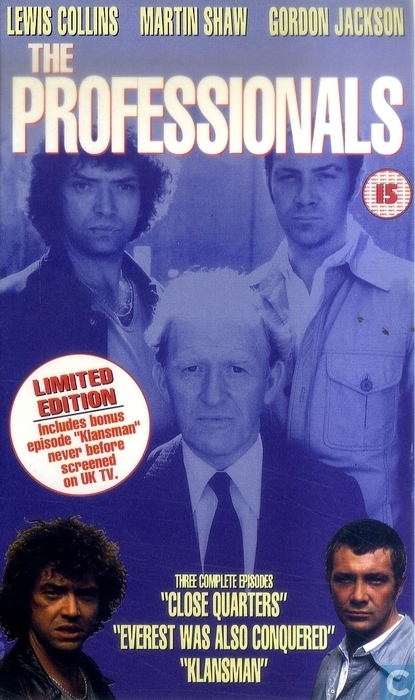 This was the first Professionals video I ever bought, from Andy's Records in December 1998. There were these as well. This is a complete left-field question. If the Pros were remade (won't happen now after the sad passing of Clemens), there was a lot of conjecture about possible actors etc. Why has no-one ever mentioned Ross Kemp as the 'Bodie' character? Both action men and can act a bit. With perhaps Sean Pertwee playing the 'Doyle' role. Apologies for disrupting the thread... and, no, haven't been drinking, apart from copious amounts Assam. I'm off to attend a home tutorial on 'Salmon tickling'. I could see Ross Kemp in the role of Bodie although he is getting on a bit now. Some more candidates for the Bodie/Doyle characters would be Tom Hardy,Mark Strong,Jason Statham,Craig Fairbrass. Probably Bill Nighy or even Gary Oldman. Ah, how about James Wilby? After another thought. Trying to think outside of the box: Jonathan Pryce would make a really good Cowley. Possibly why I would make a rubbish casting director. 'Killer With A Long Arm' is one of my favourite epsiodes. Good performances from Michael Latimer and Diane Keen , and Suzanne Danielle is also in it.